The Pennsylvania State Police’s Western Auto Theft Task Force was nominated and received the IAATI’s ACG/Heavy Equipment Award. 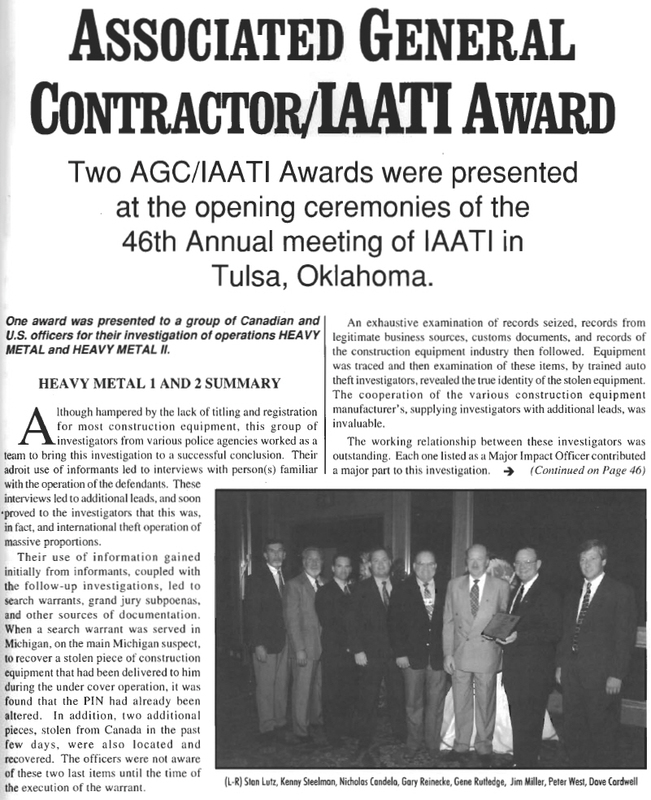 However, because last year’s seminar was held in Sydney, Australia and travel was prohibited, the award was presented to them April 22, 2009, by the PA Auto Theft Prevention Authority’s Executive Director, Michelle Staton, who also serves as 4th Vice President for the NE Chapter of IAATI. 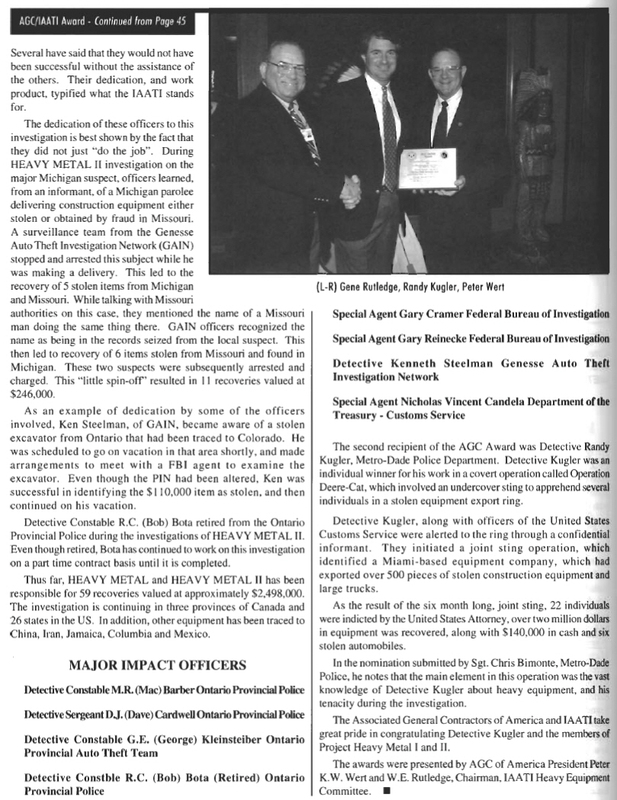 The case for which they were nominated demonstrates excellent auto theft investigative efforts, as well as excellent cooperation between multiple agencies and multiple jurisdictions. The case involved Pennsylvania and Ohio. The Troopers were called by the Meadville Station to assist at a heavy equipment auction in Crawford County, as there were several pieces of heavy equipment in question but they were unable to confirm their status. Upon examination by Western Auto Theft Task Force personnel, it was determined that all eight pieces of heavy equipment were re-tagged and re-stamped. Specifically, the accused had changed the last digit or two by re-stamping the numbers as well as located and changed the secondary PINs. Further investigation determined that all the machines had been stolen from the Cleveland, Ohio area. Investigators used the intelligence gathered during the initial incident to recover an additional 12 machines from various areas of Pennsylvania and Ohio, with several suspects committing crimes in both states. 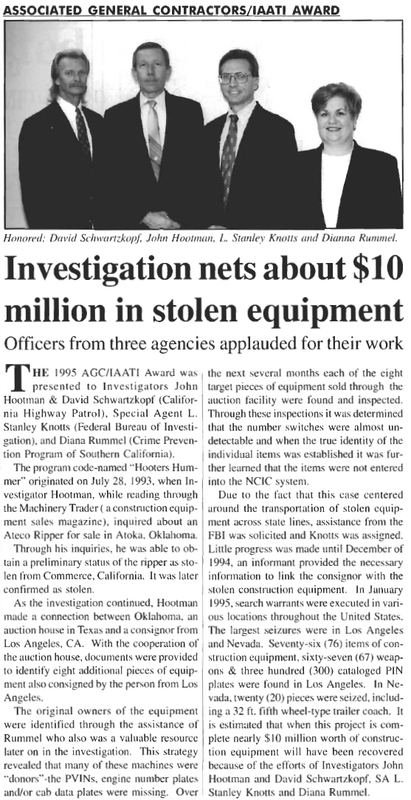 The Pennsylvania officers were assisted by an investigator with the Ohio State Police and an NICB agent from Ohio who coordinated the investigation in Ohio and also recovered several machines. The Western Auto Theft Task Force coordinated their efforts with the Ohio agents and numerous county and municipal law enforcement agencies, as well as with the United States Attorney’s Offices in Ohio and Pennsylvania to commence prosecution. After a lengthy investigation, the total value of the equipment recovered is estimated in the $1,000,000 to $2,000,000 range. The case is now in the prosecution phase. Congratulations to the winners! S/A Nicholas Vincent Candela , US Customs, Treasury Dept.